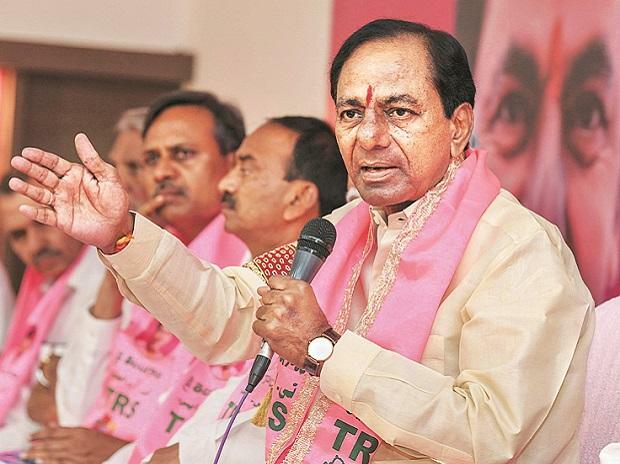 Telangana Chief Minister K Chandrashekar Rao on Sunday attacked the Congress over the issue of land survey in the state. "We have never ignored land surveys, the Congress government did that. I promise all the farmers that we will conduct all the land surveys, Till now we have handed over land pass books to 54 lakh farmers," the Chief Minister said in his address to the Telangana Assembly. Rao said that while the Congress had for decades neglected farmers, his government was providing them 100 per cent subsidy for building double bedroom houses. He further rebuked claims by Congress members that the Kanti Velugu initiative of his government has resulted in the loss of vision in a lot of people. "I want to make it clear that we haven't done a single eye operation till now we will start doing it soon. It's completely wrong that some people lost their eyes," the Telangana Rashtriya Samiti (TRS) chief said. Rao also assured implementation of the Panchayat Bill immediately after the general elections. "Prime Minister Modi had asked me to implement Ayushman Bharat scheme many times but we already have Arogyasri, a good health scheme begun by Rajshekar Reddy while he was Chief Minister. We will continue with the same scheme as it is better than Ayushman Bharat scheme," he said. The government said the Centre had not responded even after sending around 500 applications requesting more funds for the scheme. "In the coming years, we will provide water to 1.25 crore acres through various new irrigation projects. This water will help all the farmers. We will also ensure that all the damaged roads will be repaired in the coming days," KCR said.